A 2019 Chevrolet Silverado will be the pace truck for the 2019 Daytona 500, and it'll be the first time ever that a pickup will lead the race. Two-time Daytona 500 winner Dale Earnhardt Jr. will be behind the wheel. The green flag on the 61st running of the event will drop on February 18. "I’ve had a lot of fun and a lot of success at Daytona over the years, and now I can’t wait to get out on that track in a Silverado," Earnhardt Jr said in Chevy's announcement. "Away from the track I’ve driven Chevy trucks all my life, and I’m excited to have this unique experience of pacing the Daytona 500 with the Silverado." 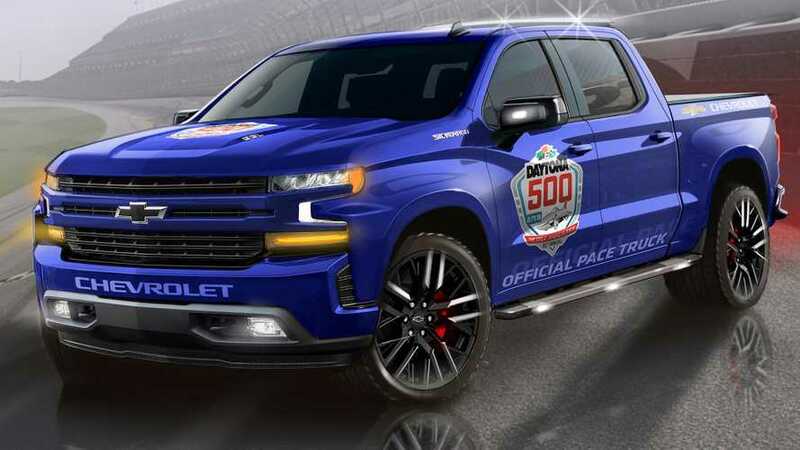 The Silverado pace truck will pack Chevy's 6.2-liter V8 producing 420 horsepower (313 kilowatts) and 460 pound-feet (624 Newton-meters) of torque. It'll hook up to the company's 10-speed automatic gearbox. This will mark the Bowtie's 13th time as pace car for the Daytona 500. The Camaro has been in front of the race seven times, and the Corvette has done it five times. Earnhardt Jr. is a veteran of driving around the Daytona International Speedway. In addition to winning the 500 twice, he scored two victories at the July NASCAR Cup race there. Plus, he won six more times at Daytona events in the NASCAR Xfinity Series. A three-driver team, including Earnhardt Jr., also took a fourth-place overall and second-place in class finish for Corvette Racing in the 2001 24 Hours of Daytona. The 2019 Silverado 1500 is currently up for the North American Truck of the Year Award. The pickup is up against its platform-mate the GMC Sierra 1500 and the new Ram 1500 for the honor. We'll find out the winner at the North American International Auto Show in January.